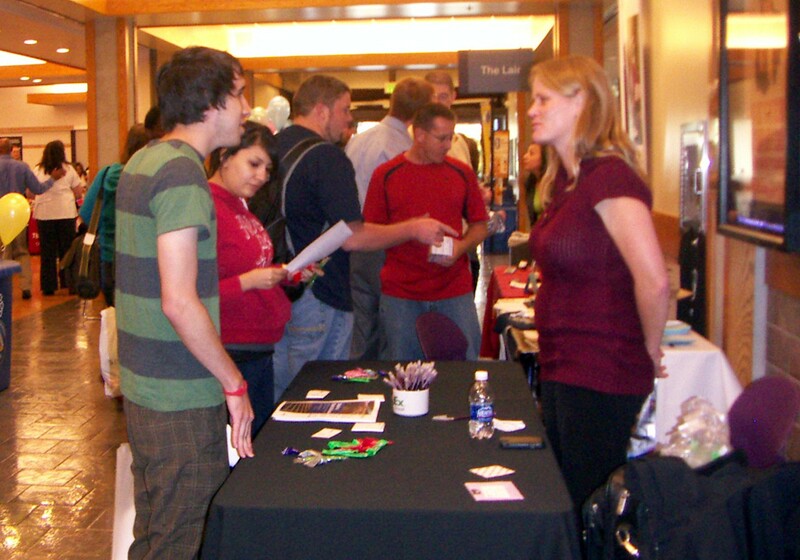 Salt Lake Community College held its annual Job Fair last Wednesday at the Taylorsville Redwood Campus. The fair provides an opportunity to match students up with employers who are interested in hiring SLCC students. “The purpose for the job fair is to have students and employers come together,” Jack Hesleph, director of Student Employment and Cooperative Education said. Lasting from 8:30 a.m. until 2:00 p.m., a total of 43 employers participated at the fair. It was the maximum number of employers that could fit stations in the Student Event Center. “I’m here just to see what kind of jobs there are. I am hoping to find a job here,” Diana Placencia social work student said. There were a number of well-known companies participating in the fair. Wells Fargo, FedEx and UPS were in attendance. Others like The Art Institute, Verizon Wireless, Convergys and America First Credit Union were getting a lot of attention from students. Even with this heavy flow of students, some of the companies did not have much traffic because they were looking for graduating students or students with a specialty. EMC, or, Enformation Management Corporation, helps their clients manage information. Their table did not seem to attract much interest from the students, mainly because they had a very special need. They were in the market for IT professionals and they hadn’t seen any. Employers are especially interested in students who are getting their Associate of Applied Science degree. They are also looking for full and part time employees that are still going to school and not yet ready to graduate, but are looking for work. Carolina Rivas is a recruiter from Wells Fargo who was at the fair. “It’s a grand success with employers finding workers and the students reaching employment expectations,” Hesleph said.